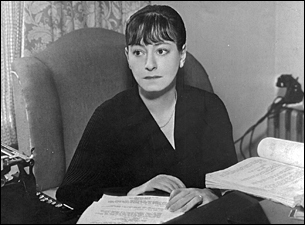 Dorothy Parker, the sardonic humorist who purveyed her wit in conversation, short stories, verse and criticism, died of a heart attack yesterday afternoon in her suite at the Volney Hotel, 23 East 74th Street. She was 73 years old and had been in frail health in recent years. In print and in person, Miss Parker sparkled with a word or phrase, for she honed her humor to its most economical size. Her rapier wit, much of it spontaneous, gained its early renown from her membership in the Algonquin Round Table, an informal luncheon group at the Algonquin Hotel in the nineteen-twenties, where some of the city’s most sedulous framers of bon mots gathered. Franklin P. Adams, the somewhat informal elder statesman of the group, printed Miss Parker’s remarks in his “Conning Tower” column and fame was quickly rapping on her door. Her lifelong reputation as a glittering, annihilating humorist in poetry, essays, short stories and in conversation was compiled and sustained brickbat by brickbat. One of her quips could make a fool a celebrity, and vice versa. She was, however, at bottom a disillusioned romantic, all the fiercer because the world spun against her sentimental nature. She truly loved flowers, dogs and a good cry; and it was this fundamental sadness and shyness that gave her humor its extraordinary bite and intensity. When the mood was on her, Miss Parker’s conversation was like a Fourth of July sparkler; but humor did not come easily to her pen. “I can’t write five words but that I change seven,” she once confessed. She took seriously her couplet about women and glasses: Men seldom make passes/At girls who wear glasses. Although she was quite nearsighted, she refrained from wearing her horn-rimmed spectacles in public, or when men were present. She much preferred to blink her luminous hazel-green eyes. “Deceptively sweet” was the phrase her friends most often applied to her. And indeed she looked it, for she was elfin, with a warm smile and perfect manners and a short-stepped ladylike walk. She had a mass of dark hair, that, toward middle age, she cut off and wore in bangs. Miss Parker’s background was not literary. She was born on Aug. 22, 1893, in West End, N.J. Her father, J. Henry Rothschild, was a New Yorker of means, her mother, the former Eliza Marston, was of Scottish descent. She attended Miss Dana’s School at Morristown, N.J., and Sacred Heart Convent in New York. After she had by chance sent some of her verses to Vogue magazine, she was hired at $10 a week to write picture captions. At the same time, Mr. Adams, who was generally known by his initials, F.P.A., published some of her poetry in his column, then appearing in The Daily Mail. Miss Parker worked for Vogue for two years, 1916 and 1917, and in the latter year was married to Edwin Pond Parker 2d. The marriage was terminated in divorce in 1928, but she retained Parker as her professional name. After her marriage, Miss Parker became drama critic for Vanity Fair from 1917 to 1920, when, during an office reorganization, she resigned. It was during the following five years that she attained her celebrity for sizzling, off-the-cuff wit from her repartee at the Algonquin Round Table. Miss Parker, Mr. Benchley and Robert E. Sherwood were the founders of the group when they all worked at Vanity Fair, which had offices at 19 West 44th Street. The group got going because the Algonquin was nearby on 44th Street, and the three could not bear to suspend their office conversations. The group rapidly expanded, and Frank Case, the hotel’s proprietor, provided a round table for it. The group, usually about 10 a day, lunched together for about a decade. At one time or another it included George S. Kaufman, Harold Ross, Donald Ogden Stewart, Russell Crouse, Edna Ferber, Heywood Broun, Ruth Gordon and, of course, F.P.A. and the three founders. Miss Parker was one of the luminaries, but took a down view of the Round Table. “People romanticize it,” she said. “This was no Mermaid Tavern. These were no giants. Think of who was writing in those days – Lardner, Fitzgerald, Faulkner and Hemingway. Those were the real giants. The Round Table was just a lot of people telling jokes and telling each other how good they were. “At first I was in awe of them because they were being published. But then I came to realize I wasn’t hearing anything very stimulating. “I remember hearing Woollcott say, reading Proust is like lying in someone else’s dirty bath water. And then he’d go into ecstasy about something called, “Valliant is the Word for Carrie,” and I knew I had enough of the Round Table. As one result of her poems and stories, Miss Parker was pointed out at parties and literary gatherings, not always to her amusement. “Are you Dorothy Parker?” a woman at one party inquired. “Yes, do you mind?” the humorist retorted. “Yes, I’ve always liked those lines,” Mr. Maugham commented. Miss Parker laced her wit with heady truth as a book reviewer, first for The New Yorker as Constant Reader and then for Esquire as book review editor for many years. Her notices were written with a chatty trenchancy, as though she were talking informally to the reader; but she could (and did) impale authors who displeased her, either by synopsizing a pompous plot in all its ludicrousness or by pulverizing the book with a phrase. Miss Parker was not entirely negative, however. She praised F. Scott Fitzgerald, the early Hemingway, some of Sinclair Lewis, James Baldwin and Edwin Albee. Miss Parker’s reputation for light poetry was based on four books of verse: “Enough Rope” (1926), “Sunset Gun” (1928), “Death and Taxes” (1931) and “Not So Deep as a Well” (1936). On the surface the poems were a blend of the cynical and the sentimental — just right for the sweet-winning generation of the late nineteen-twenties and early nineteen-thirties. And after that, I get them all mixed up. But oh, what a good girl am I! Have no guilt of me. Solider, when were soldiers true? Lie not lone til day! But I must say for Burton, he’s heaps broader-minded than lots of these Southerners. He’s really fond of colored people. Why, he says himself he wouldn’t have white servants. In 1933, Miss Parker was married to Alan Campbell, an actor. They were divorced in 1947 and remarried three years later. The Campbells went to Hollywood and collaborated on a number of motion picture scenarios; between times Miss Parker wrote short stories and book notices. Mr. Campbell died in California in June 1963, and Miss Parker, already ill, moved back to New York. Miss Parker, for all her mercury-quick mind, was a careful, even painful, craftsman. She had her own definition of humor, and it demanded lonely, perfectionist writing to make the truly funny seem casual and uncontrived. Toward the end of her life, Miss Parker was convinced that humor had fallen on evil days. From the nineteen-twenties, when Miss Parker was fined $5 for “sauntering” in a Boston demonstration against the execution of Nicola Sacco and Bartolomeo Vanzetti, she was active in liberal causes. In the Spanish Civil War and afterwards, she was the national chairman of the Joint Anti-Fascist Refugee Committee and active in its behalf. This had repercussions in 1951 when she was cited by the House Un-American Activities Committee, with 300 other writers, professors, actors and artists, for affiliation with what the committee designated as “Communist-front” organizations. One committee witness identified her as a member of the Communist party, an accusation she persistently denied. In her final illness, Miss Parker was melancholy about her life’s accomplishments. She wanted to write again, especially short stories, but she lacked the strength. Miss Parker left no survivors. A funeral service will be held tomorrow at 10:30 a.m. at Frank E. Campbell’s, Madison Avenue and 81st Street. Lillian Hellman, the playwright, and Zero Mostel, the actor, will deliver eulogies.